Outdoor Expeditions USA, LLC is a licensed and insured guide service for freshwater fishing on Shearon Harris, Jordan Lake and Falls Lake near Raleigh, North Carolina. Since the 90s when I started guiding fishing trips on North Carolina’s best bass lakes, I have spent countless hours studying the topography of the lakes, forage and seasonal patterns of the fish that call these amazing bodies of water home. I enjoy sharing what I have learned with clients to help them understand the “what’s and why’s” of it all and help them become more efficient in locating and catching fish. A regular contributor to NC Sportsman Magazine, I have also been featured on Southern Outdoor Adventures TV (Falls Lake episode 2002), Bob Redfern’s Outdoor Magazine on Fox Sports (Shearon Harris episode 2017) and Eva Shockey’s Outdoor 101 (Jordan Lake 2018). I have a good understanding of Lowrance HDS electronics, including interpreting a specific species of fish and fish holding cover/structure on these lakes. I offer one-on-one on the water training for Lowrance HDS units as well as sales, installation, optimization and custom mapping services. I am proud to be a part of the Lowrance Pro Staff team for 2019. 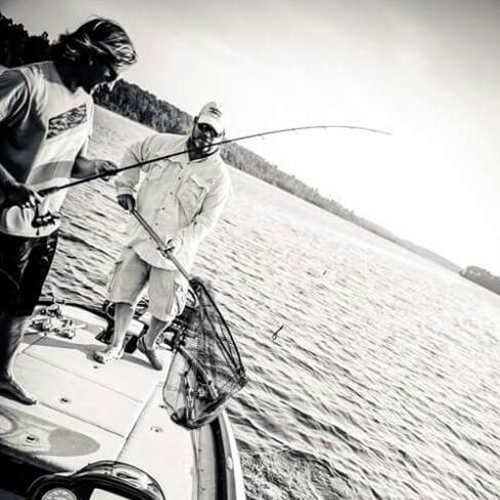 My goal is to provide you with an enjoyable, safe and productive day of fishing on the water. I cater to and welcome anglers of all experience levels. I take my job seriously and my focus is on clients catching fish, learning better fishing skills, and most of all having a great time. My philosophy on fishing is that you get out of it what you put in to it. In the fishing business, giving 100% every single time is not optional. Let me share my passion with you.